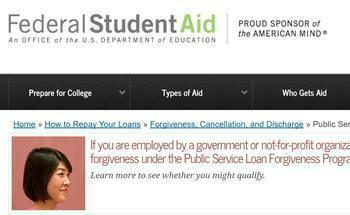 Go to the Department of Education website, and the prospect of getting your student loans forgiven looks like a tantalizingly real possibility. All that the approximately 40 million Americans with outstanding student debt would have to do, it seems, is work in a field serving the public. Stick with a job in government or the non-profit world while repaying your loans every month and the remainder of the debt is forgiven after 120 payments, or a decade’s worth of both public service work and on-time loan payments. “For many college students, the dream of working in public service, as a teacher, nurse, public health official, or at a non-profit organization comes with a worry that their salary will not be enough to allow them to pay back their loans and pay their bills,” the DoE writes on its website advertising Public Student Loan Forgiveness Program. The Public Student Loan Forgiveness program was launched in 2007, exactly ten years ago, meaning that the first wave of participants should, in theory, see the remainder of their debt forgiven by the end of this year. “Borrowers who meet requirements of the program will see remaining outstanding balances forgiven beginning in October 2017,” the DoE promises. But the program is not as straightforward as it appears. Four alumni who were told they qualified for student loan forgiveness are now suing the federal government. After initially being told that their work qualified as public service work, DoE sent the alumni letters years later reversing the decision, as the New York Times reported in March. Problems with the program were apparent even before the alumni filed suit against the government. People who could qualify for loan forgiveness do not always realize that to be considered, they must combine all of their student loans -- potentially losing lower, older interest rates in the process --and give the consolidated loan to one single company, the federal loan contractor FedLoan Servicing. The DoE describes this consolidation as an almost-automatic process. 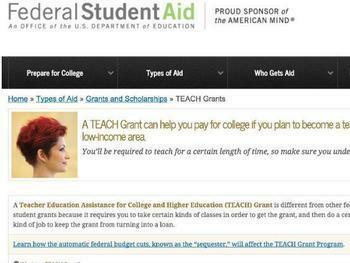 “If we determine that your employment qualifies, and if some or all of your federal student loans that are owned by the US Department of Education are not already serviced by FedLoan Servicing...those loans will be transferred to FedLoan Servicing,” the DoE says. But that supposedly automatic consolidation is where the problems began for Chris Gurrie, a speech professor at the University of Tampa, who amassed thousands in debt while getting his master’s degree and then doctorate. Since Gurrie had been teaching since 2005, he assumed that he would be automatically enrolled in the forgiveness program when it was introduced several years later. He did not realize until 2014 the singular role that one company, Fedloan, played. As a coworker explained to him, Gurrie needed to be proactive, formally apply for loan forgiveness every year, and then arrange to have FedLoan consolidate his loans. Only then would the clock begin ticking on his ten-year plan for loan forgiveness. Gurrie quickly contacted FedLoan and agreed to get the process started, losing his older, better interest rates in the process, he tells ConsumerAffairs. Then he started getting bills in the mail indicating that he still owed money to Sallie Mae, a different loan servicer. In other words, Fedloan didn’t consolidate his loans, even though they said they did. 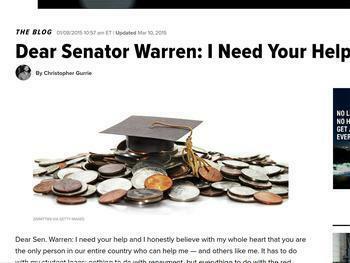 In 2015, Gurrie had become so frustrated trying to get his loans consolidated through FedLoan that he wrote an open letter to Sen. Elizabeth Warren (D-Mass.) 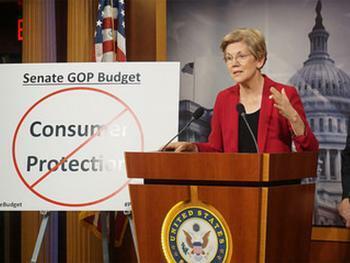 and published it in the Huffungton Post under the headline, “Dear Senator Warren: I Need Your Help." As Gurrie wrote, "If anyone else reading this knows how to help with this consolidation process, I would love your feedback as well. We have to make it easier for borrowers to payback their loans. 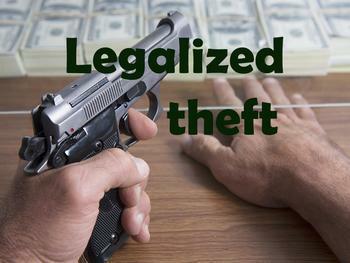 It shouldn’t be this hard to set up a program and repay someone their money." Senator Warren never responded directly, but another surprising person did, a high-level worker at FedLoan, Gurrie recalls. The person called Gurrie shortly after his blog post went live. “He was like the head honcho dude...He had his own office line, in Pennsylvania, and he was my dude, and he did everything for me. He figured out why [the loans weren’t consolidated]. He figured out the glitch. The computer didn’t know how to handle some sort of code. He consolidated it for me.” (Notes that Gurrie saved and later reviewed say that the person who called was Matt Eschelman, "Leader of Borrower Advocates" with the company). FedLoan is run by the Pennsylvania Higher Education Assistance Agency, a student lender that handles billions of dollars worth of loans and is not actually a state agency, despite its name, according to a 2015 appeals court ruling. (The PHEAA was created by the state of Pennsylvania, but an appeals courts decided in 2015 that it is financially and commercially independent from the state). “We do have layers of escalation,” when it comes to customer service, New tells ConsumerAffairs. “We have the call-center loan counselors that deal with individuals on a daily basis,” and an "escalation" process for people who aren’t getting help from the call centers. New otherwise referred any questions about the public student loan forgiveness program to the federal government. “They’ve asked us across the board -- it’s their asset, they prefer to deal with the media inquiries." The DoE has never responded to a single ConsumerAffairs request for comment about this and related problems. Gurrie, meanwhile, still receives emails from other people who don’t know how to get their loans consolidated, and who aren’t getting clear instructions from the federal government or from FedLoan. Gurrie doubts he would have gotten the same treatment from a "head honcho dude" in Pennsylvania had he not had the opportunity to publicly blast the company online. And he notes that many people working in public service may not have the time for the lengthy and frustrating calls with FedLoan customer service. To demonstrate what it’s like for people to try to get information about their student loan and their status in the loan forgiveness program, Gurrie agreed to let ConsmerAffairs listen in on a call he made to FedLoan customer service last week. Gurrie called to get an update on where he stood in the loan forgiveness program. In the call, Gurrie gets surprising and upsetting news. An agent tells Gurrie that their records show he only made 19 payments toward his loan forgiveness. Gurrie believes that their records are missing about 12 payments, or over a year’s worth of payments he had made after getting his loan consolidated with FedLoan in 2014. As Gurrie grows frustrated, the agent says she will need to speak to a supervisor to figure out the discrepancy. After a hold period, she eventually gets back on the line and explains the problem. On one piece of paper that Gurrie’s employer had submitted to FedLoan, part of the annual application process necessary to be considered for public loan forgiveness, a “6” in a date line looked slightly messy, or “squiggly,” the agent says, as if it had been crossed out. Because of that “6," FedLoan determined that Gurrie’s paperwork may have been improperly altered. And, because of that, his application for that year had not been approved. In other words, all 12 loan payments Gurrie thought he was making toward his loan forgiveness for an entire year did not actually count. But the agent tells Gurrie this can be fixed. If he and his employer submit a new form for that year, correcting the squiggly “6,” FedLoan and can go back and add those missing payments to his records. It’s an encouraging end to the call, but sorting the mess out did not happen quickly. The entire call, between being put on hold and figuring out his status in the forgiveness program, lasted for 50 minutes. Gurrie plans to submit the paperwork this week and anticipates that it will take FedLoan at least one week to reconsider his missing payments. It’s not the first time that someone dealing with FedLoan Servicing has been tripped up by a seemingly minor paperwork error. A 2015 ConsumerAffairs investigation revealed that the Department of Education and FedLoan were using paperwork errors as an excuse to suddenly convert grants into unsubsidized loans. College students who agreed to teach in high-needs schools, often difficult jobs that came with less pay, were promised something called a TEACH grant, or a Teacher Education Assistance for College and Higher Education Grant, a $4,000 gift in exchange for agreeing to take on the difficult teaching work. But the teachers in the program weren’t warned that if they make any mistakes in their paperwork—such as missing a signature on one piece of paper of the many forms they must submit—then the grant is suddenly converted into an unsubsidized loan, serviced by FedLoan. Several of the affected teachers are now suing FedLoan over this practice. New, the lender’s spokesman, also referred questions about the TEACH grants back to the federal government, which did not respond. Meanwhile, the Education Department, facing a lawsuit from four people who are attempting to be re-considered for the public service loan forgiveness program after their eligibility was sudden revoked, responded to the suit with a legal filing that could have disturbing implications for the estimated 550,00 people currently enrolled. The DoE wrote to the court in March that any approval letters that FedLoan has written to people working in public service, letting them know that they qualify for loan forgiveness, are not official, non-binding, and can be rescinded at any time. An approval letter from FedLoan "does not reflect a final agency action," the DoE claims.